There is increasing interest in policies that can effectively address deeply uncertain conditions or developments. ignoring uncertainty can result in missed chances and opportunities. In Parts I and II of the book, a variety of analytical approaches (and tools) are proposed to handle situations of decisionmaking under deep uncertainty (DMDU). These DMDU approaches all have their roots in Assumption-Based Planning (ABP) which, given an initial policy, tries to protect this policy from failing, by (see Fig. 17.1b): (1) examining each of the underlying assumptions, and seeing what would happen to the initial policy if that assumption were not to be true, and (2) developing contingent actions to protect the initial policy from failing and adjusting the policy in the future as needed. In this way, all the analytical approaches in this book try to improve the adaptivity and robustness of a policy—i.e., to make a policy more resistant to significant change, and to help a decisionmaker to identify when to adapt the policy. In this sense, the DMDU approaches turn the traditional approach to policy analysis (Fig. 17.1a) upside down. 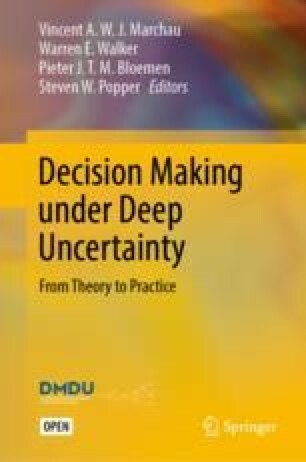 In addition to describing DMDU approaches in theory and practice, the book (Part III) looks into the design of institutions and processes to facilitate decisionmaking under deep uncertainty. This requires the specification of procedures and legislation to: (a) enable policies to respond to events and information as they arise, (b) undertake data collection (monitoring), and (c) repeatedly review goals. Finally, the two chapters constituting Part IV draw upon the material presented in the earlier chapters—not as recapitulation but rather as a synthesis. In a field that has grown so rapidly in both methods and applications, these chapters propose a framing of the field as it has developed to date, as well as a trajectory for application moving forward. Chapter 15 presents a synthesis and guide to the DMDU field with emphasis on its key ideas, and an attempt to frame a taxonomy for its burgeoning set of methods. Chapter 16 derives from the applications presented in the book a theory of where, why, and to what ends DMDU methods may be applied to a growing class of policy conundrums that have confounded the application of more traditional analytical approaches in the past. As stated above, all of the approaches in this book have their roots conceptually in ABP. Comparing the approaches, both commonalities and differences can be identified. All of the approaches represent uncertainties with a broad range of futures instead of probabilities of specific future states of the world. The way exploratory modeling, a central element in most approaches, is used in combination with adaptive policies explicitly includes uncertainties arising from simulating the real world in a system model. The range of futures may be limited by choosing to prepare “only” for plausible futures. What is considered a “plausible” future is subject to different interpretations (which may be a function of personal beliefs, political setting, etc. ), and depends on one’s expectations about the future and understanding of the system. Moreover, what is considered acceptable performance of a policy depends on people’s values. IG examines a set of predefined alternatives to identify the one that is most robust. RDM mainly focuses on increasing the robustness of the initial policy using Scenario Discovery. DAP adds triggers to change the initial policy, and specifies the contingent actions. DAPP adds the sequencing of changes to the initial policy by adding contingent actions. The focus of EOA is on exploring the performance of diverse alternative system designs in more detail, each with varying degrees of flexibility in the form of options. Explore a wide variety of relevant uncertainties in a dynamic way. Connect short-term targets and long-term goals. Commit to short-term actions while keeping options open for the future. RDM focuses on designing a robust policy by embedding contingencies in its implementation; adaptation can be added on to the policy to respond to external developments. DAP makes explicit the importance of monitoring and adapting to changes over time to prevent the initial policy from failing. DAPP expands the contingency planning concept from DAP by specifying the conditions and time frame under which adaptation of the initial policy is continued into the far future. As such, these three approaches can be seen as extensions of each other. IG can be categorized as an approach for robust decisionmaking. In contrast to the other approaches considered in this paper, unforeseen events (Black Swans) are not incorporated: IG addresses modeled uncertainty, not unexpected uncertainty. EOA, with its detailed analysis of different possible (technical) alternatives provides unique insights, distinct from and complementary to those obtained from the other DMDU approaches. DMDU scholars often implicitly assume that their approaches will automatically be welcomed—that this way of reasoning will be embraced politically and accepted institutionally—suggesting that implementing a DMDU approach is mainly a technical and intellectual challenge. Experience, however, shows that in real-life decisionmaking, organizational aspects play a major role in determining the willingness and ultimate success in applying approaches for dealing with deep uncertainty in practice. First of all, an appealing and convincing narrative is required to mobilize political interest for addressing an issue characterized by deep uncertainty—notably when it involves starting up a costly long-term program. As illustrated in Part III of the book, an adaptive approach can do the job, especially when informative illustrations such as adaptation pathway maps are used. Following the decision to actually start a long-term program, it is important to create the conditions that can keep politics involved “at arm’s length”—well-informed on the main results of the program, but not encouraged or compelled to actively intervene in everyday operational issues. In the case of the Dutch Delta Programme, the Parliament and Senate agreed that the water-related challenges of climate proofing the Netherlands needed to be addressed in a long-term program, secured by the underlying Delta Act, the position of a relatively independent Delta Programme Commissioner assigned to manage the program, and a guaranteed budget of €1 billion per year for decades to come. A robust, stable basis constitutes not only a precondition for consistency in reacting to new challenges, but also allows for the agility in decisionmaking that is required for adaptive policies. Alertness and willingness at both the political and administrative levels, to adjust strategies and plans to changing conditions, are key in an adaptive approach. Organizational complexes are needed that can effectively plan to adapt. Part III presents a conceptual model of planned adaptation. Much of the work on adaptive policymaking is about establishing primary rules that describe how to sustain system function and integrity—for example, formal standards for minimal heights and for construction requirements of levees that guarantee a certain level of flood safety. These are the rules that determine either how a system should be monitored and sustained, or how the system itself is to function. The DMDU approaches and tools described in Parts I and II of this book are means by which an analyst may systematically evaluate and develop the knowledge informing primary rules for policymakers to manage a given system. As illustrated in Part III, secondary rules should also be considered. They are about how to recognize, create, maintain, and adjudicate primary rules. Secondary rules are “all about [primary rules]; in the sense that while primary rules are concerned with the actions that individuals must or must not do, these secondary rules are all concerned with the primary rules themselves. They specify the ways in which the primary rules may be conclusively ascertained, introduced, eliminated, varied, and the fact of their violation conclusively determined” (Hart 1994). It follows that adaptive processes must strike a balance between the canonical objective of regulation (creating stability) and the potential for chaos if feedback loops trigger changes too frequently. Implementing adaptive strategies requires organizational arrangements for systematically accommodating adjustments of policies, strategies, and plans, a monitoring system for timely detection of signals, and a decisionmaking process that links directly to its output. Challenges for further development of adaptive approaches comprise, among others, determining Adaptation Tipping Points in situations of low signal-to-noise ratio (e.g. large natural variability in river discharge) and preparing a switch from incremental to transformational interventions. Among more political challenges are formulating precise policy goals and keeping long-term options open. On a more general level, it can be concluded that DMDU approaches, such as those described in the scientific literature, can profit from feedback—feedback from other researchers, and feedback from practitioners. Organizing the latter (an instrumental element of “coproduction of knowledge”) might be more time-consuming, but is likely to be very effective. The main objective of DMDU approaches is to facilitate the development of policies that are robust and/or adaptive, meaning that they perform satisfactorily under a wide variety of futures and can be adapted over time to (unforeseen) future conditions. Agreeing in advance about what future conditions require what contingent actions increases the chances that the policy goals will be reached—with the original strategy or with an adapted version. Doing this might be more time-consuming, but is likely to be very effective. The breakthroughs in analytical technique over the past two decades have occurred in the presence of increased general awareness of the reality of irreducible uncertainty in practical applications. This has led to a proliferation of methods—and in the description of them. All are subject to interpretation, offer quite some leeway to the user in how to use them, and are changing over time. The present book is a testament to the need to first focus on the building blocks that make up the various approaches. This may lead to a future synthesis where DMDU as a field comes more to be viewed as an approach in itself with particular applications being constructed by swapping one building block with another one. This task is made easier because of the centrality of fundamental concepts in DMDU thinking: exploratory modeling, adaptation, and decision support. Chapter 15 provides the first taxonomic step on the road to exploring the possibility of such a synthesis as well as a guide to its design. Chapter 16 argues that the time for doing so is ripe. If one may observe a general dissatisfaction with, or general incapacity of, the institutions of democratic governance to meet the challenges now confronting all societies, the origins stem in large part from those circumstances for which DMDU methods were designed: a bewildering number of interacting elements; path dependence, unpredictability, emergence, and other phenomena associated with complex systems; irreducible uncertainty; proliferation of information sources and stakeholder interests; and the inability of single government agencies to deal with all aspects of problems that touch upon our lives in many ways. DMDU methods collectively represent an evolving capacity to support policy processes better suited to deep uncertainty and dynamic change. DMDU applications collectively present a body of theory and practice with the potential for providing a common vocabulary to the work of both analysts and of those charged with policy design and implementation during uncertain times. To realize this full potential, two things must occur. Analysts who apply DMDU methods to policy problems must think through measures, both individual and collective, to make the possibilities for providing meaningful support to policy more widely known. And the policy community should take more explicit cognizance of the shortcomings in the more traditional use of analysis in the policy process in the presence of the policy challenges they currently face, and so provide the opening that DMDU practitioners require to demonstrate the value of their approaches and tools. The process of education needs to be mutual. Improvement of the existing DMDU approaches, especially the tools (Part I), in terms of faster, simpler models and their more transparent use. In particular, there is a need to consider how the power of DMDU may be brought to bear on those problems for which there are few formal models. Further guidance on when and how to apply a specific DMDU approach and tools is needed (Part II). Dittrich et al. (2016) propose a framework for how different DMDU approaches can work in different circumstances, depending on the characteristics of the adaptation options being considered, the data available, and the time and skills available to the decisionmaker. The scope of DMDU applications (Part II) should be broadened from their current focus on climate change and water management to other policy issues that are faced with deep uncertainty. Examples include transportation, energy, security, health care, and spatial planning. How can the current DMDU knowledge be applied to these and other domains? “Monitor and adapt” is gradually becoming preferred by policy analysts to “predict then act” as the strategy for long-term decisionmaking in the face of deep uncertainty. i.e., as a means to design policies that are able to achieve economic, environmental, and social objectives for a long-term uncertain future. More needs to be done to bridge the gap between DMDU researchers and policymakers to improve mutual understanding (Part III). The authors of the chapters in this book are already hard at work in developing solutions to these challenges. They and their students will carry DMDU concepts, tools, and approaches to the next level to meet the challenges in the coming years.